Before May 18, 1980, Mt. 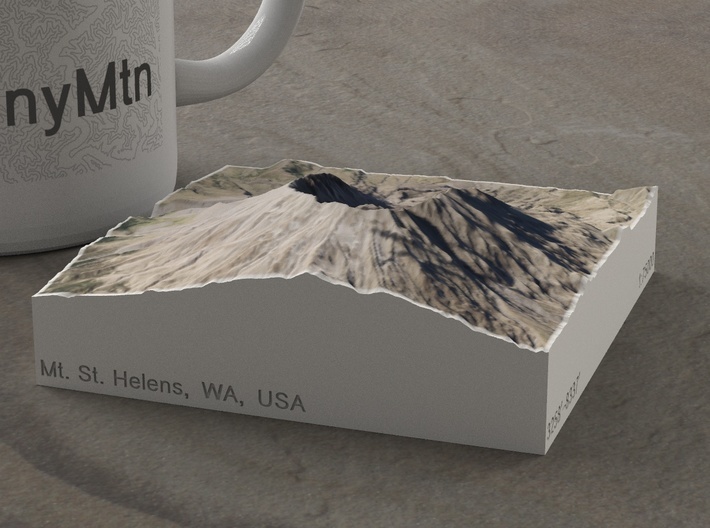 St. Helens, a stratovolcano in southern Washington State, looked like many of the other high peaks in the Cascade Volcanic Arc: conical, steep, and snow-covered. But after that day's eruption, which moved nearly a cubic mile of debris from the peak down to the Toutle River and Spirit Lake, the landscape was grey and dead for miles around. The mountain lost 1300' of elevation, and the top became a crater a mile wide. The area was made a U.S. National Monument in 1982, hikers were allowed back on the summit in 1986. Though forests were knocked down and covered with grey ash and pumice, vegetation has made a surprising and resilient recovery, making the valley glow green in spring. 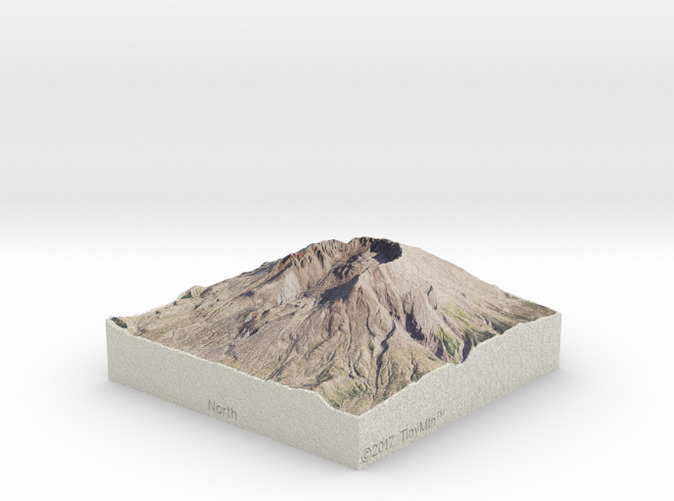 This model shows the post-eruption terrain, with its unmistakable open-sided crater and lava dome. In addition, hikers will recognize the top portion of Monitor Ridge and Shoestring Glacier. 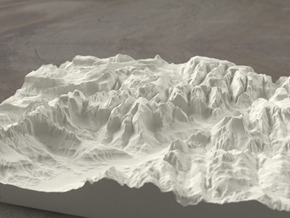 Other features on this model are Crescent Ridge and the head of the South Fork of the Toutle River to the West, part of Studebaker Ridge to the North, and Windy Pass to the Northeast. 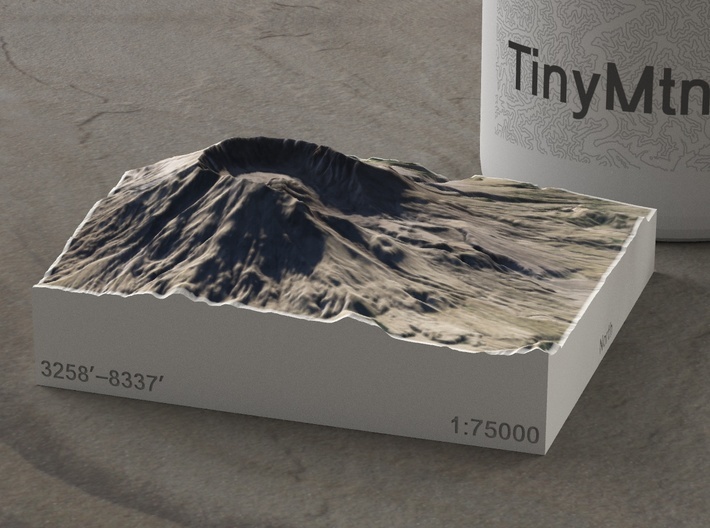 Simply put, two-dimensional maps cannot convey the magnitude of the eruption, but holding this piece in your hands, you just might begin to understand. 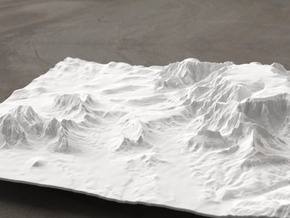 The Explorer series of TinyMtn models is designed to break our usual impression of mountains. We generally see mountains one at a time, from a distance, and from the ground. 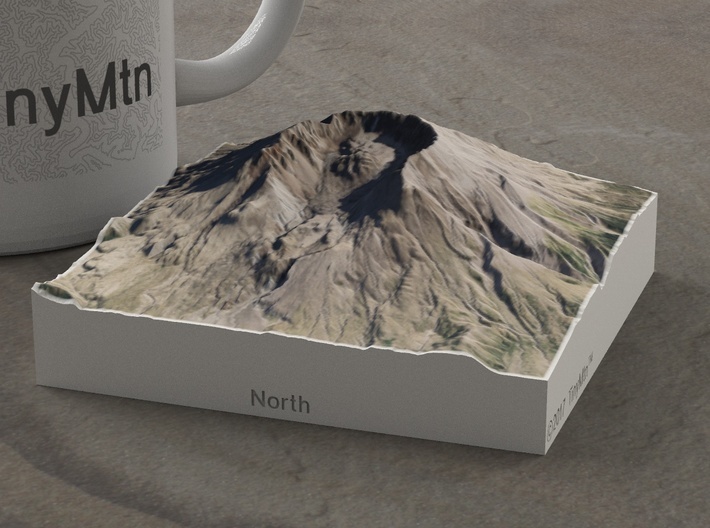 While all TinyMtn models give you a fresh perspective on any one peak, the Explorer series presents mountains in identical scale, and shifted up so that sea level is at the bottom of the base. Thus, when you set two Explorer models next to each other, you will immediately notice which is taller, which rises more from its base, which is more massive, and so on. Plus, all Explorer models come in full color, making them just that much more realistic. 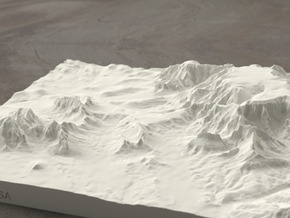 Click here for other 1:75000 models in the Explorer series. 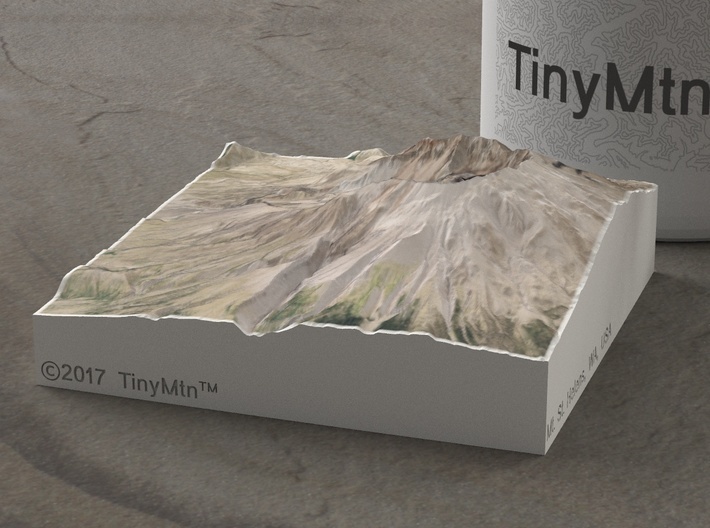 TinyMtn models are most affordable in the "Sandstone" and "White Natural Versatile Plastic" materials. 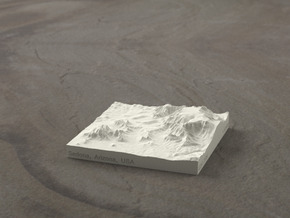 This model is in "Sandstone," which is a glued gypsum material. When you receive the model it will be ready for display, though it may smell funny and need some time to air out. "Sandstone" models are much more brittle than "Versatile Plastic" models, but feel more like light stone. Do not soak it in water, though you can safely seal it with Polycrylic or a similar water-based clear spray sealant. Read more about this popular material here.